It is time for you to make money from your shopping. Hello to all online shoppers in Cameroon. Today i will be sharing with you how you can save 21000 FCFA by shopping on Jumia. 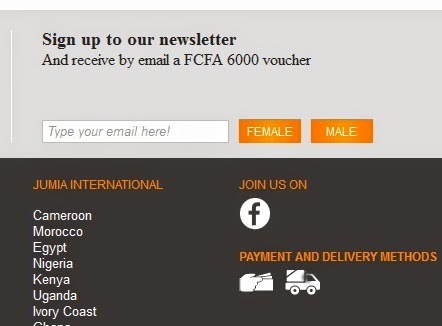 The first way to save on Jumia is by signing up for the Jumia Newsletter. That gives you a 6000 FCFA Voucher. The next 15000 FCFA can be obtained, by selecting a product that cost 60000FCFA and above. Then proceed to check out. Apply this code ''SHEEP2015'' when ask for a Coupon Code. Jumia will pay 15000FCFA for you plus the 6000 FCFA voucher for signing uP for Jumia News letter make you pay 39000 FCFA for a very good product such as an android phone my favorite. Happy online Shoppping. I am very glad to have such useful information. Thanks for sharing!